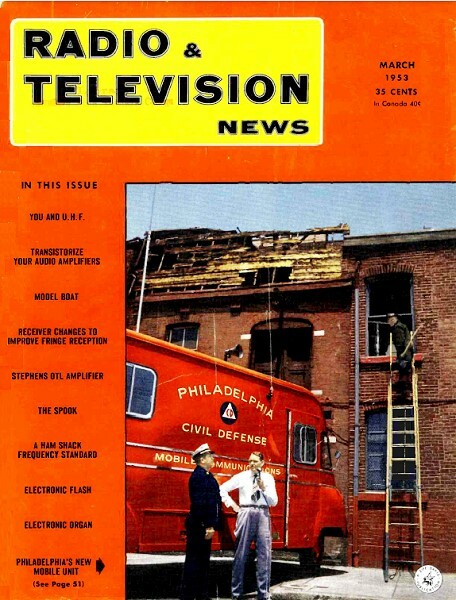 [Table of Contents]These articles are scanned and OCRed from old editions of the Radio & Television News magazine. Here is a list of the Radio & Television News articles I have already posted. All copyrights (if any) are hereby acknowledged. It was a lot of work to put together a radio control model of any sort in 1953, but the complexity of this paddlewheel model boat seems excessive. It claims, through careful consideration and design, to have overcome to main two obstacles of entering the remote control model realm - a need to possess expert modeling skills and a need to possess an amateur radio operator license. Obstacle one is (ostensibly) overcome through simple boat and electronics construction, and obstacle two is overcome through use of a radio that operates in the unlicensed Citizens band. I'll give them the second, but at least to today's ARF and RTF hobbyist population, the first is still way beyond the ability of most enthusiasts. You're probably tired of hearing it if you read my notes often, but the fundamental lack in hands-on craftsmen in the country (all countries) is pretty pathetic. Evidently such abilities aren't required for society to progress... but that depends on your definition of progress. Here it is! A "Citizens Band" radio control system, easy to build, simple to operate, and no license exam required! Fig. 1. The "River King" ready for launching. Switches on the bow are for receiver and motors. Remote control of model planes and boats is a facet of radio which has long intrigued many hams and experimenters. However, two factors have kept most fellows from taking up this branch of the hobby. In the first place, as each succeeding article on the subject has appeared in contemporary publications, the models, the radio gear, or both have become more and more complicated. Secondly, the possession of a radio operator's license has been a prerequisite to the operation of radio control equipment. Since a large number of licensed hams aren't expert model makers and since many model makers lack operator's licenses, only a few people have so far had the opportunity of experimenting with radio control systems. The "River King" was designed expressly to meet these two problems. It requires no particular skill to construct and uses a simple one-tube receiver. Any U.S. citizen over 18 can, without taking a technical exam, obtain the necessary Citizens Radio station license for the transmitter. Although the FCC's rules governing the Citizens Radio Service have allowed radio control on the 460-470 mc. band since June 1, 1949, the equipment specifications for these frequencies have been so stringent that only commercial transmitters have been practical up to now. A recent amendment to the rules, however, has opened the door to inexpensive home-built gear operating on 27.255 mc. Transmitters using this new frequency are designated as "Class C" Citizens Radio Stations and, when registered with the FCC, may be used without an operator's license. The owner takes out a license for the equipment by a fairly simple procedure outlined toward the end of this article. Fig. 2. The 27-mc. "Citizens Band" transmitter, built in a 3"x4"x5" utility box. The batteries are also housed in this box. Unless a fellow is a dyed-in-the-wool model maker, he finds it hard enough to build an airplane that looks like a plane, let alone flies. On the other hand, almost any piece of wood will float. Thus, a model boat appears to be a logical beginner's choice for a radio control project. Since a flat bottomed hull with no complicated curves to cut makes for easy modeling, a side-wheel river steamer using this type of hull is a suitable prototype from which an approximate copy may be constructed. The one-tube superregenerative receiver used in the boat is designed around a Raytheon type RK-61 subminiature gas triode. With the exception of the plate relay, all receiver parts are standard and can be readily obtained from any well-stocked jobber. The plate relay I used came from a surplus BC-645 and was originally sealed in a cylindrical can with a 5-prong plug. 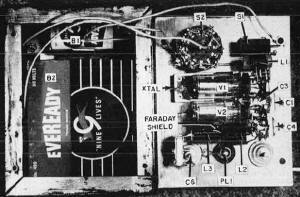 After being removed from its housing the relay was mounted on top of the receiver chassis. If you can't locate one of these relays, I would suggest that you obtain an 8000 ohm Sigma type 4F. The latter is still available quite reasonably on the surplus market. The RK-61 has tinned leads in place of base pins. It can be held in place with a small clamp and the leads may then be soldered directly into the circuit. Use a clean, hot, well-tinned iron, preferably one with a small tip. Do the job neatly but as quickly as possible so that too much heat will not be conducted into this small tube. The receiver filament switch, S1 and motor switch, S2 are mounted on the deck, forward of the cabin, and can be operated without removing the superstructure. Two switches are used so that the receiver and motors may be run independently. It is difficult to make precise receiver adjustments while the paddle wheels are revolving. The smoke stack, an 18" length of 3/4" aluminum tubing, acts as a receiving antenna. While much shorter than a resonant 11-meter antenna, it picks up enough signal to produce reliable model response several hundred feet from the small transmitter to be described. Greater antenna length will increase the working range of the model, but there seems little point in operating the device very far from the observer. After all, most of the enjoyment in running the boat comes from being able to watch it maneuver. Beyond two hundred feet, it looks pretty small. Fig. 3. Construction details of the "River King" radio-controlled river boat. The superstructure is thin balsa wood. the hull 1/4" plywood and the deck Masonite. The tall aluminum "smokestack" acts as the antenna for the receiver in the hull. The electrical circuits and mechanical linkages used in many radio control systems are quite complex. Transmitters sometimes utilize intricate modulators and keyers which send out specially coded signals that must be translated by the receiver into the proper model maneuver. Actually, it is possible to obtain several different and interesting model responses by merely turning a transmitter carrier on and off. Fig. 4. Pattern for the rotary stepping switch in the receiver. The base is 1/4" plywood, 5" in diameter. The switch segments (shaded areas) are thin sheet metal A 1/4" hole is drilled in the center for the shaft, which also drives rudder crank. Fig. 5. Top view of the hull, with the superstructure removed. Placement of parts can vary according to materials on hand, but weight should be evenly distributed and heavy items such as batteries kept low in the hull. The paddle shalt is made from two 1/4" carriage bolts. At extreme right is the old dial pointer used as coupling between the rudder and the slotted "tiller:" which is about 4 1/8" long and is driven by a homemade crank on the selector switch shalt. 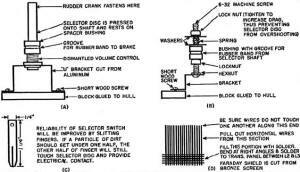 Both the rudder and selector switch shafts and bearings are made from old Volume controls. Examination of Fig. 6 will reveal that the plate relay of the receiver acts as a s.p.d.t. switch. Since the receiver's plate current drops when a signal is picked up, if the transmitter is on, the relay is open and contact Y receives 1 1/2 volts via the relay armature. When the transmitter is switched off, the receiver plate current increases and the relay closes. Contact X then receives 1 1/2 volts. Relay contact X is connected to finger 1 and contact Y to finger 3 of the rotary selector switch. One lead of the selector switch motor is grounded. The other lead runs to finger 2 on the selector switch. 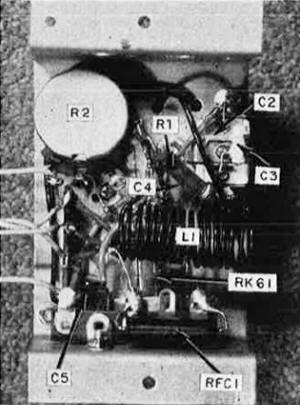 When the transmitter goes on, the switch motor circuit is completed via the relay armature, relay contact Y, finger 3, a segment on the selector disc, and finger 2. The switch motor receives power and the selector disc turns. It can only go a little way, though, because the connection between fingers 2 and 3 is soon broken due to the shape of the segment on the selector disc. 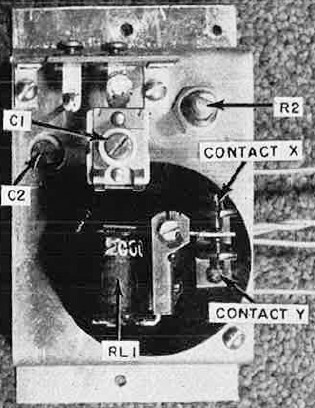 When plate voltage is removed from the transmitter the relay closes and the switch motor is again energized, this time via contact X, finger 1, a different selector segment, and finger 2. 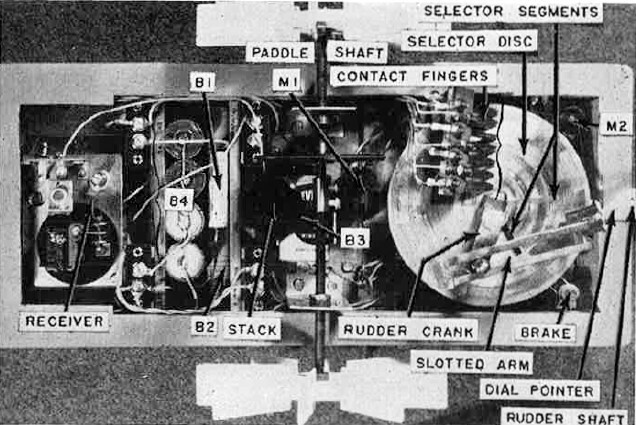 The selector disc turns until finger's 1 and 2 are no longer connected with one another through the disc segment. This time when the disc stops, fingers 4, 5, 6, and 7 make contact with segments which connect the paddle motor to battery, B4. Depending on what polarity voltage is applied to this motor by the arrangement of the segments, the paddles will drive the boat either forward or backward. If no segments are in this particular position, the paddle motor, of course, stops. At the same time the selector disc turns, the steering arm also turns, thereby changing the rudder position (see Fig. 5). With the segment layout shown in Fig. 4, there are six possible maneuvers: 1. Forward straight. 2. Stop. 3. Forward port (left). 4. Reverse straight. 5. Forward starboard (right.) 6. Stop. This arrangement is sufficient to provide a great deal of entertainment while maintaining a relatively simple system. The sequence of operations is such that when going from one desired maneuver to another, the undesired positions through which the selector must pass have little effect on the action of the craft. For example, in going from forward straight to forward starboard, it is necessary to go through positions 2, 3, and 4. At 2 the paddles stop. At 3 the paddles start to go forward, but before they can pick up speed, they are reversed by position 4. Position 5, the one desired, is reached long before the boat starts to back. 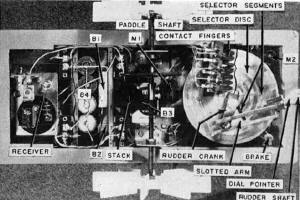 A time delay circuit could be used to keep the paddles at rest until the selector is in position for the desired maneuver. However, this would be a rather unnecessary complication as each following position more or less nullifies the previous action. Inspection of Fig. 4 will show that a small portion of the selector switch must be covered with insulating material to avoid shorting the switch contacts as that portion is reached. Scotch tape was used in this model, but if any difficulty occurs with the tape cracking, or the switch fingers tracking adhesive out from under the tape, a few thin coats of polystyrene coil dope or radio service cement can be used instead, if they are allowed to dry sufficiently. The BC-645 relay is not quite so sensitive as one of the usual radio control types. Nevertheless, if it is adjusted carefully, it will perform very well. In order to correctly set the relay, it is necessary to insert a low range milliammeter in series with the "B-plus" lead of the receiver. First, contact X, the one which controls the spacing between the armature and the pole piece, should be adjusted so that when the relay is energized, the armature just clears the pole piece. If the armature-pole piece spacing is too great, the sensitivity of the relay will be low, while if the armature touches the pole piece, it is apt to stick when the relay is de-energized. Next, the pull-in and drop-out range should be checked. With "A" and "B" voltages applied to the receiver, advance the regeneration control until the relay can be heard to snap closed, then back off on the control until the relay clicks open. The current difference between pull in and drop out should be no greater than .2 ma, If it is, the spacing between the relay points should be reduced. The relay should close at approximately 1.0 ma. and open at around .8 ma. If more current is required to close the relay, the spring tension should be reduced. If it closes at less than 1.0 ma., the spring tension should be increased. With a more sensitive relay, the pull-in and drop-out range may easily be set to a variation of only .1 ma., thus resulting in somewhat greater control sensitivity. The process of relay adjustment is not difficult, but you should keep the following points in mind: 1. As soon as the armature-pole piece spacing is set, do not change the position of contact X. Make all changes in contact gap spacing by varying the position of contact Y. 2. Never advance the regeneration control beyond the point where plate current exceeds 1.5 ma., otherwise the life of the RK-61 will be materially reduced. As soon as the relay is properly adjusted, the receiver can be tuned up. Advance the regeneration control, R2, until plate current is between 1.1 and 1.2 ma. The relay will act as a miniature loudspeaker and should give forth with the characteristic squeal of a superregenerator. Have someone operate the transmitter at a distance of at least 100 feet. Tighten antenna coupling condenser, C1 fairly well and then adjust C2 until the receiver is tuned to the transmitter's frequency as evidenced by a dip in plate current, accompanied by the opening of the relay and a lack of superregenerative squeal. C1 should then be readjusted, to find the smallest capacity that gives positive relay operation when the transmitter is switched on. The no-signal receiver current should be set slightly under 1.2 ma. From time to time as the RK-61 ages, C1 and the regeneration control will require touching up. When the tube is reaching its limit of usefulness, an idling current of as much as 1.6 ma, may be required to obtain positive pull in action with no signal. Rated life of an RK-61 is between 3 and 10 hours. However, if the idling current is held in the vicinity of 1.2 ma. for as long as possible, the tube will probably last somewhat longer. The dimensions of the boat are not very critical. The "River King" was my first attempt at marine architecture and it can definitely be improved upon in both appearance and sea-worthiness. For example, another 3/4" added to the depth of the hull would allow the use of heavier, longer-lived batteries. 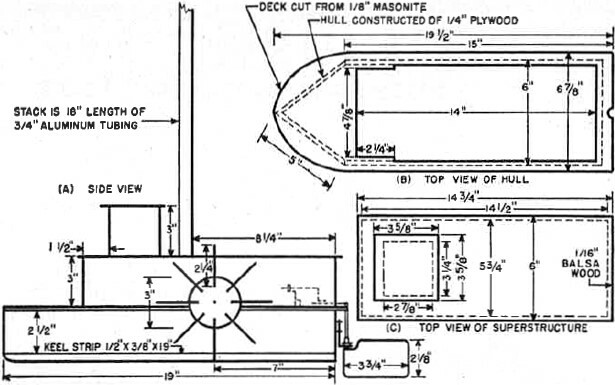 The hull is made of 1/4" plywood (see Fig. 3). The various pieces can be cut out with either a power or hand scroll saw and then fastened together with waterproof glue such as Cascophen. The glue must be applied very liberally and after it sets, all joints should be smeared with an extra coat, thereby insuring watertight joints. It is a good idea to give the inside of the hull a coat of spar varnish so that if it accidentally gets wet, it won't absorb water. The deck may be cut from a piece of 1/8" Masonite and then glued to the hull. The exterior should receive two applications of enamel undercoat and one of high grade enamel. The boat is powered by a midget plastic-cased motor designed to operate from ordinary flashlight cells. Fig. 6. Wiring diagram of the receiver, motors, and selector switch contact fingers. The receiver is built on a small "U" chassis which may be homemade and is mounted in the bow. S1 and S2 are mounted up on deck. See Figs. 7 and 8. These motors are on sale at toy and model supply stores and are priced from $1.50 to $2.00 apiece. Despite a rating of only 1/2000 horsepower, one of these little motors is capable of propelling a model boat at greater than scale speed. Fig. 7. Bottom view of the receiver. The RK-61 tube, which has no socket, is mounted along the centerline of chassis. Fig. 8. Top view of the receiver. 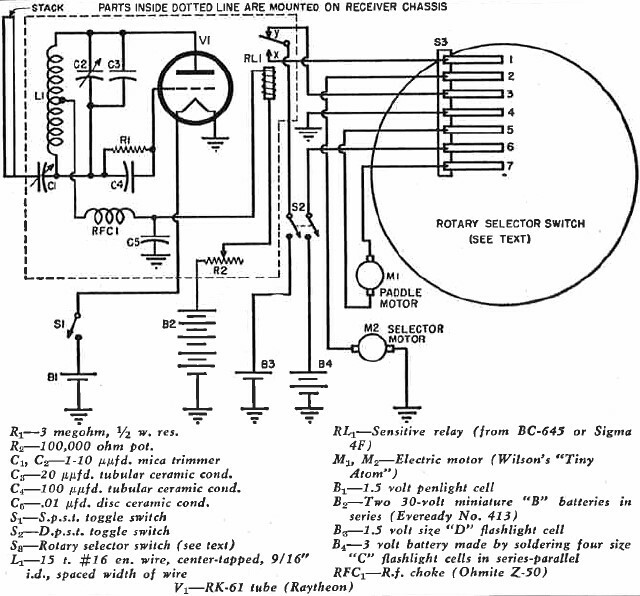 The relay shown is from a surplus BC-645 but other types may be substituted (see text). Fig. 9. (A) Selector switch shaft and bearing assembly, taken from an old Volume control. (B) Adjustable brake for the rotary selector switch. (C) One of the contact fingers. Length is approximate. (D) Faraday shield for the transmitter. A similar motor drives the selector switch that controls both the direction of paddle rotation and the rudder position. This motor, M2, is mounted vertically in the stern (see Fig. 5). 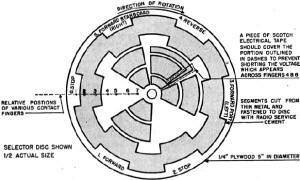 The rotating disc portion of the selector is made from a piece of 1/4" plywood, 5" in diameter. It must be carefully cut to shape and a groove filed in the edge to receive the rubber band that acts as a drive belt. The shaft and bearing of the selector can be adapted from an old Volume control. The control should be dismantled until all that remains is the shaft and its associated panel bushing. This is then fastened to a U-shaped bracket cut from sheet aluminum and the bracket is screwed to a small piece of wood previously glued to the hull. Put a hole in the center of the selector disc with a 1/4" drill and press the disc onto the old Volume control shaft. If the disc fits too loosely, one or two applications of service cement to the edges of the hole will reduce its size sufficiently to stop the disc from slipping on the shaft. A spacer bushing keeps the disc at the proper height with respect to the switch motor's shaft. Since a Volume control bearing operates smoothly, it is quite likely that the selector disc may coast from one segment to another, thus going past a desired position. This overshoot problem can be minimized by increasing the pressure of the contact fingers against the disc or by constructing the brake shown in Fig. 9B. Tighten the top nut on the brake only enough to keep the disc from coasting too far. Otherwise, the selector motor will be overloaded and may, at times, lack sufficient power to rotate the disc. The segments of the selector disc can be fashioned from thin sheet metal. I used heavy copper foil picked up at a surplus store. After the segments have been cut to proper shape, fasten them to the disc with radio service cement. The contact fingers for my switch were cut from the same copper as the segments. Use any metal which is thin and fairly springy. Rubber bands act as drive belts for both the paddles and the selector disc. No pulleys are required on the motor shafts since the rubber bands are kept in alignment by grooves in the edges of the selector disc and the paddle shaft pulley. The latter item, by the way, was originally a part of the dial mechanism from an old radio. A pulley cut out of 1/4" plywood should work just as well. The paddle wheels are made from 3" discs of 1/4" plywood. Eight radial slots 3/4" long are cut in the discs at regular intervals as shown in Fig. 3A, and 1" by 2 1/4" pieces of aluminum are forced into the slots. Cascophen or radio service cement should be daubed on the ends of the paddles so that they will adhere to the slots. The paddle shaft is made from two 1/4" carriage bolts, the heads of which have been cut off, the two bolts then being fastened together with a 1/4" shaft coupler. The paddle wheels have 1/4" holes drilled in the center and are held in place on the threaded ends of the shaft bolts between nuts and washers. The shaft bearings are simply 1/4" holes drilled in two aluminum brackets that support the paddle assembly. The shaft is held in position between the bearings by means of brass collars fastened to the shaft with set screws. The rudder bearing, salvaged from another discarded Volume control, is mounted on a small, L-shaped bracket at the rear of the hull. A piece of lightweight galvanized iron is cut into the shape of a rudder and is soldered to what was originally the potentiometer end of the shaft. An old dial pointer is fastened to the other end of the shaft. The slotted arm, or "tiller," actuated by the rudder crank of the selector switch is, in turn, soldered to the dial pointer (see Fig. 5). If no suitable dial pointer is readily available you can, of course, cut out a small sheet-metal tab, with a 14" hole for the rudder shaft, and go on from there. The slot in the "tiller" is about 4 1/8" long. 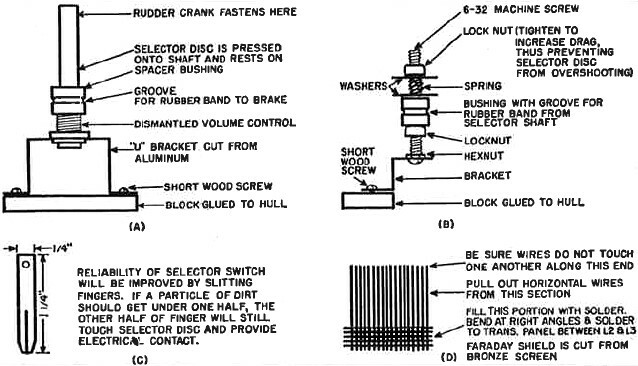 The crank arm is about 1 3/4''' between the center of the selector shaft and the center of the screw-and-nut or whatever you use as a drive pin or "handle." The dimensions of these three items are not critical. The old Volume-control shaft will, of course, have to be long enough so that the crank and swinging tiller will clear the top of the wood or plastic strip that holds the selector fingers. A superstructure must be built to hide the works of the model. The cabin and pilot house are cut from lengths of 1/16" by 3" balsa wood, and then fastened together with radio service cement (see Fig. 3). It is absolutely necessary that balsa be used, otherwise the cabin will weigh too much and will make the boat top-heavy. Balsa may be purchased in strip form at almost any store selling model airplane supplies. It is easily worked, the only tool required being a sharp razor blade. Both the hull and superstructure are finished with a good grade of white enamel. The deck, cabin roof, and pilot house roof are painted gray. Doors and windows may be drawn on heavy paper with India ink, cut out and then applied to the cabin with rubber cement. A hole in the roof allows the cabin to be slipped down over the smoke stack. The superstructure merely sits on the deck and may easily be removed for making receiver adjustments. Fig. 10. 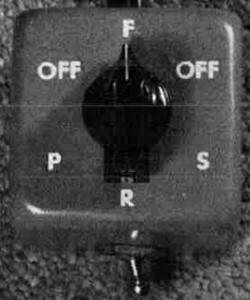 Remote selector switch for use with an 11-meter amateur transmitter. A key or toggle switch may be used instead. Fig. 11. The ham-rig switch of Fig. 10. It is turned counter clockwise to control the receiver selector switch on the boat. Fig. 12. All transmitter parts are mounted on one cover of a 3"x4"x5" utility box. The tube sockets mount on L-shaped brackets. Holes should be drilled in the case opposite C1, C4, and C6 for adjustment alter the cover is fastened to the box. Since the motors used in the "River King" are very small, it is important that little power be wasted in friction. Make certain that all bearing surfaces are kept well oiled. The fingers and segments of the selector switch, as well as the points of the receiver relay must be kept very clean. Apply a little carbon tet to them at regular intervals. Steer clear of any kind of contact dope, though, because it will pick up dust and dirt, thus resulting in unreliable selector operation. 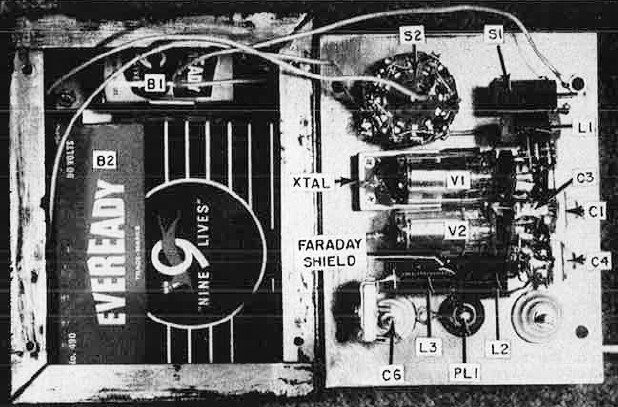 The Citizens Radio Service transmitter, designed as a companion for this receiver (Fig. 13), will operate either on the Citizens Service frequency or in the amateur band 26.960-27.230 mc., depending on the crystal used and your license privileges. If you are already lucky enough to be the owner of an 11-meter amateur mobile transmitter, you have little reason to build a whole new rig just for radio control purposes. All you have to do is connect a switch in series with the ground leads to the cathodes of the r.f. tubes as shown in Fig. 10. 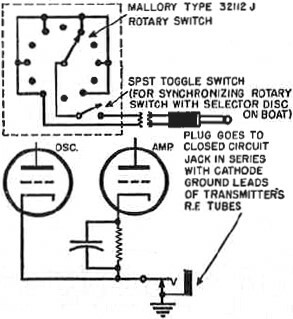 Although a telegraph key or toggle switch might be used, a rotary switch is superior, because it gives a visual indication of the various ship maneuvers. As long as the switch is not rotated too rapidly, and in a counter clockwise direction, the selector disc on the boat and the switch knob will stay in sync. Should the two get out of step for any reason, a toggle switch in series with the rotary switch may be opened and the knob set to the position corresponding to the maneuver being performed by the boat. Such a switch is shown in the remote-control switch box, Figs. 10 and 11. It is not included in the self-powered Citizens Band transmitter, because the transmitter can be turned off to reset the selector switch and turned right on again, as the 3V4's require no warm-up time. One precaution must be observed when adapting a mobile rig to radio control. Be sure to key both the oscillator and the final. Otherwise there is a possibility that some r.f. energy will be radiated, even though the final is off. The superregenerative receiver is very sensitive and the slightest amount of r.f. leakage from the transmitter will keep the relay from operating properly. In those cases where no amateur mobile rig is available, it will be necessary to construct a special radio control transmitter. For greatest convenience and portability, dry battery operation is a "must." Since no great distances are to be covered, only small power output is required. At first thought it might appear that a one tube crystal oscillator would perform the job satisfactorily. However, there seems to be no easy way to obtain adequate power from any of the common 1.4-volt filament tubes when used as oscillators with 11-meter overtone crystals. 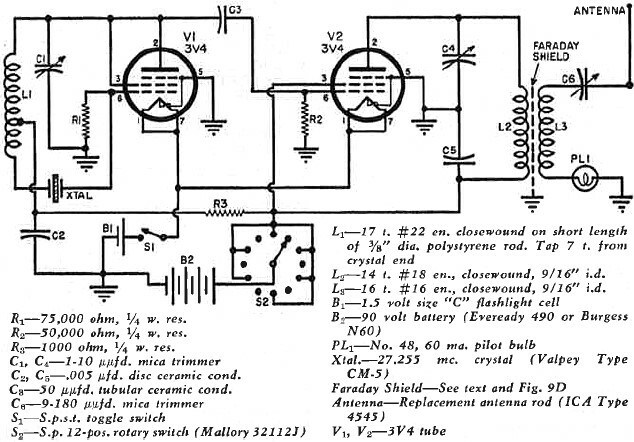 Even the simplest transmitter for 27 mc. appears to require a minimum of two tubes. The first circuit I tried employed a crystal near 6800 kc., doubled in the oscillator and also doubled in the final. Usable output was obtained on 27 mc., and since a low frequency crystal is much cheaper than one of the over-tone type, the circuit looked quite promising. That is, until a check with an all-wave receiver revealed that the transmitter's output in the vicinity of the twenty-meter amateur band was less than 30 db below the 27 mc. output. Consequently this particular circuit failed to meet the technical requirements for Class C Citizens Radio Stations, which state that spurious emissions must be at least 40 db down. The transmitter finally evolved is diagrammed in Fig. 13. It uses a 3V4 as a 27 mc. overtone crystal oscillator and a 3V4 amplifier. Checks show that when the 27 mc. signal is 30 db over S9, the 54 mc. output is so low that it fails to move the needle of an SX-71 receiver's "S" meter, thus easily meeting the FCC's requirements. There are two main factors which hold the harmonic output to such a low level. The amplifier is operated with only a little more than "Class A" bias, and a Faraday shield (Fig. 9D) reduces capacity coupling between the final tank and the antenna coil. All transmitter parts are mounted on the front cover of a 3" by 4" by 5" metal utility box, as shown in Fig. 12. Paint should be scraped from the inside of the covers and from the edges of the box so that good electrical contact will be maintained. Fig. 13. 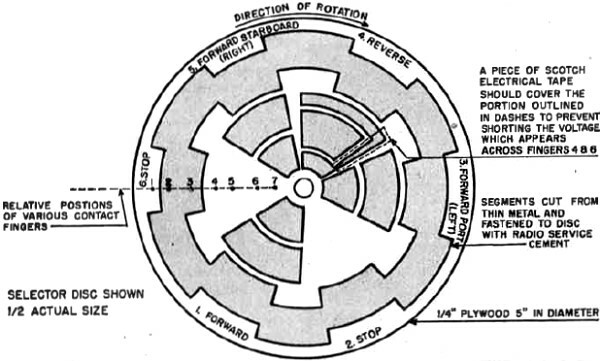 Schematic of the Citizens Band transmitter. Switch S2 turns the carrier on and off. The receiver selector switch moves one position each time a carrier signal is received. If the transmitter and receiver switches fall out of step, the transmitter can be turned off and S2 reset to the boat's present maneuver. The crystal fits into a miniature socket made by sawing in half the dual crystal socket from a BC-746A tuning unit. Of course, any small FT-243-type socket may be used, such as the Cinch-Jones #2 KM. unit. The tube sockets are fastened to the panel with small L-shaped brackets. A pilot bulb in series with the antenna coil gives an indication of output current. It is merely pressed into a rubber grommet in the front panel. No socket is employed, leads being soldered directly to the base of the bulb. The oscillator and amplifier trimmer condensers are soldered to the panel. Two ceramic feedthrough insulators support the 36" telescoping antenna, as shown in Fig. 2, the bottom insulator being used to feed the transmitter's output via C6. An Eveready 490 or Burgess N60 "B" battery will fit into the box and still leave room for a single small flashlight cell to supply filament power. Regular snap-on connectors are used with the "B" battery while a clip-type holder constructed from pieces of aluminum makes for easy "A" battery replacement. The self-tapping screws supplied with the 3" by 4" by 5" box should be removed from the back cover. Replace them with short 6-32 machine screws and nuts. Otherwise, the sharp points of the self tapping screws may work their way into the "B" battery and ruin it. A square of corrugated cardboard used as a buffer between the rear of the transmitter and the batteries will keep the latter from flopping around inside the box. Despite its small size, the life of the "B" battery should be quite long because it furnishes current only when a command is transmitted. Adjustment of the transmitter is very simple. If you are a ham and plan to employ the 11-meter amateur band, you can make use of the simple instructions which follow. On the other hand, if you expect to operate the transmitter as a "Class C" Citizens Radio Station, the adjustments will have to be made by someone holding a commercial operator's license. Preliminary tests are made with the front cover removed from the box so a temporary jumper should be run from the cover to the box in order to complete the filament circuit. A milliammeter is then hooked in series with the "B-plus" lead going to the tap switch. Turn on the filaments, make sure the tap switch is on a live spot and note the plate current. If it exceeds 25 ma., the chances are that the crystal is not oscillating. Adjust C1 until a point is reached where the current drops sharply, denoting crystal oscillation. C4 should be tuned from minimum to maximum capacity. Somewhere in this range, the milliammeter will show a small dip, probably not more than a mil or so. Set C4 at this point of minimum current. Pull the antenna out to its full length and tune C6 for maximum brilliance of the pilot bulb. When the transmitter is operating correctly, total plate current will be in the neighborhood of 20 ma. and the bulb should glow brightly. Attach the cover and, through holes drilled in the case, readjust C4 and C6 to maximum bulb brightness. C1 should then be tightened as much as possible. However, if it is set too tightly, the crystal will oscillate erratically, on the wrong frequency, or it may not start at all as the tap switch is rotated. Choose a setting where the bulb lights just as soon as the tap switch hits a live contact. Finally, the carrier frequency must be checked. If the unit is to work in the 11-meter amateur band all one has to do is make sure that the output appears somewhere in that band. When the transmitter operates as a "Class C" Citizens Station, however, a very critical frequency check must be made. The FCC requires that the carrier be within .04% of 27.255 mc. According to my slide rule, this is a deviation of not more than 10.9 kc. Actually, the transmitter should be much closer to the assigned frequency in order to allow for temperature variations, etc. which can crop up in normal use. Although no operator's license is required for Citizens Band equipment, a Citizens Radio Station license must be obtained by completing FCC Form 505 and mailing it to the nearest Commission field office. Before filing Form 505, it will pay you to read carefully Part 19 of the Commission's "Rules Governing the Citizens Radio Service." You can obtain it from the Superintendent of Documents, Government Printing Office, Washington 25, D. C. for ten cents in coin. I've had a great deal of pleasure from the "River King. If you decide to build and operate a similar model, you, too, can look forward to many hours of fun. And don't overlook the fact that a Citizens Station may be operated by anyone, provided he has permission from the licensee. Youngsters, especially, get a kick out of putting the boat through its paces. Maybe you can go in partnership with your son or younger brother - he to build the boat, you to wire the radio equipment. No matter how you go about it, try a radio-controlled model. I know you'll find the effort worthwhile. 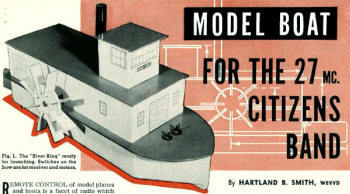 North, William L.; "Radio Control of Model Boat," RADIO & TELEVISION NEWS, August 1950. Ford, Walter B.; "A Six Foot Radio-Controlled Model Boat," RADIO & TELEVISION NEWS, July 1951. McEntee, Howard G.; "Proportional Radio Control," RADIO & TELEVISION NEWS, September 1951. 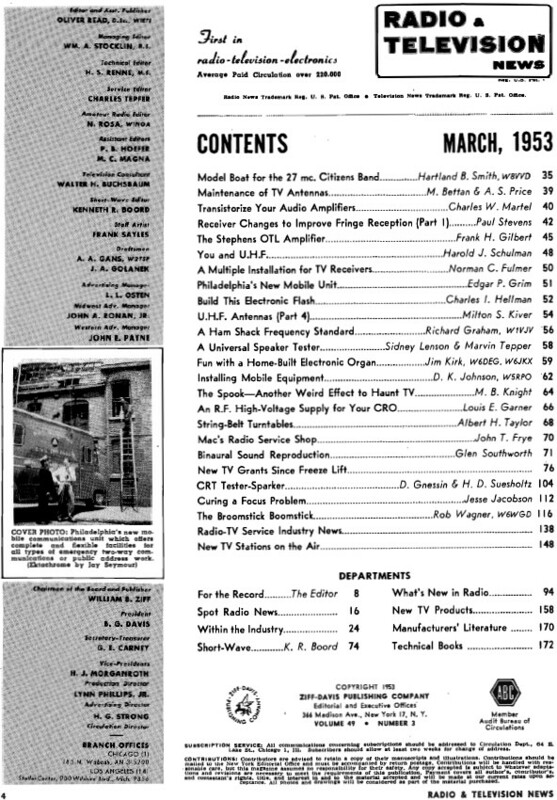 MacNabb, Vernon C.; "Radio Control on the Citizens Band," RADIO & TELEVISION NEWS, March 1952. Good, Walter A. & Good, William E.; "Receivers tor Radio-Controlled Models," QST, September 1951. 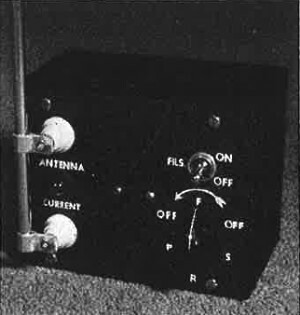 Lawson, Harry W., Jr.; "A Radio-Control System for Models," QST, February 1952. Safford, Edward L., Jr.; "Model Control by Radio," Gernsback Library No. 43, Radiocraft Publications, Inc., New York.